A few days ago, the first church built in Brittany (France) since 1971 was consecrated in Rennes. It is a work made in white concrete, the favourite material of Portuguese architect Álvaro Siza. The first building by Portuguese architect Álvaro Siza in France, in Saint-Jacques-de-la-Lande, close to Rennes, is a church made in white concrete, the favourite material of this great architect. In this church, the poetry of light becomes an integral part of the building. Moreover, this is the first church built in Brittany since 1971, thus setting two records. This religious building was created by Siza along with Jean-Pierre Pranlas-Descours, the project manager in charge of the local town-planning. Back in 2009, Pranlas-Descours contacted Siza specifically asking him to build a new church, intended both as a sacred building, and as a versatile place, open to the life of the multi-ethnic neighbourhood of Morinais. 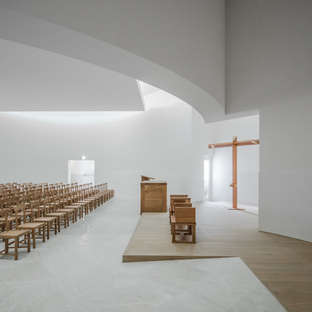 The Portuguese architect started designing his work also taking into account the changes in the liturgy that brought about a new concept of the church spaces. The Anastasis church, consecrated on past 11 February, was built in a 400-square-meter lot, close to an old chapel. This white building, spanning a height of 12 meters and with an overall surface of 650 square meters, can already be seen from the Rennes-Redon highway. With its round naves, recalling those of the ancient Oriental churches, the building presented several challenges during its construction phase, including the on-site realisation of the reinforced concrete roof, featuring a 15-metre ground clearance and housing the great clerestory, the main source of light. As requested, Siza paid great attention to the dialogue with the context, so as to invite people in “to discover the mystery inside it": the ground floor, indeed, houses multi-purpose spaces designed for the worshippers and the community and featuring wide windows overlooking the nearby buildings and the green area, still to be properly arranged. This work also makes an important reference to religious symbolism: indeed, as it happens with the Church of the Holy Sepulchre of Jerusalem, only visiting the first floor is it possible to discover the very heart of the building, a vast circular hall without windows with seating for 150 people, a white marble flooring and oak wood furniture designed by the Portuguese architect. Here, faith is transposed into architecture: the round hall symbolises the sky, and the square, suspended platform hiding the clerestory, the source of light, represents humanity. The great crucifix in polished metal, instead, is an invitation to spirituality.